A somewhat funny and out there movie, that also definitely feels dated, not just in its ideas, but in its pacing and approach to storytelling. An interesting take on an alien story, this one is more Invasion of the Body Snatchers than Independence Day, meaning the aliens on the streets are actually us. Humans. Only what’s inside is something totally different. It takes a homeless drifter named Nada, (played by wrestling great Rody Rody Piper) to expose all this. The ideas here are pretty cool, but the movie takes a little too long to get going. We don’t see our first glimpses of the aliens until nearly halfway through the film. This one definitely takes its time to show us Nada first have to find a job, then have to find a place to stay, then investigate the mysterious building nearby, then have to find the glasses, and only after that, when he puts those glasses on, do we get to see the aliens for the first time. There is some pretty decent humor here and the movie definitely has the right vibe, (after all, it was made by John Carpenter, back in a decade where he was at the top of his game. This might be his last real memorable film. It’s not great, but it certainly is creative. They Live is a John Carpenter movie made just after the time when Carpenter was at his peak. In the late seventies, Carpenter directed Halloween, and then used that movie as a launching pad to springboard him into the eighties, where he cleaned up. Escape From New York, The Thing, Big Trouble In Little China. These movies were all fantastic and fun and unique. They also all featured Kurt Russell. 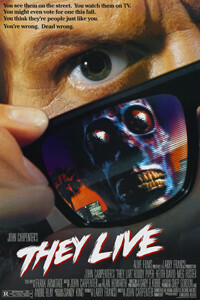 They Live doesn’t. 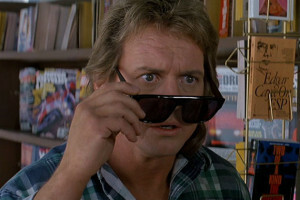 It does try to capture some of that same weird mystical energy that made Carpenter’s other movies so great, but with Roddy Piper as the star, and a movie that takes its time to show to slowly and eventually get to the ideas we are all waiting for, this movie definitely doesn’t work as well as one might have hoped. The ideas that make this film so crazy are that there are sunglasses where, if you put them on, you see people for who they really are. And apparently some people are really aliens whose faces look like skulls, when you see them through the glasses. These are people who are superficial and cruel and ruining our society. But all of this doesn’t come out until quite a while into the film. What we do get, from the very beginning, is the story of a homeless drifter looking for work and also looking for a place to stay. While Piper might be out of his league in this movie (he was a wrestler,) for David, this is some pretty perfect material. He plays. tough guy so well in movies like this. Around the same time that this movie was made, David was also in The Thing, Road House, and Men at Work. Here, David is the one who really makes the movie with his reluctance to believe Nada about the things his friend says he sees, and his anger at the man for taking liberties with both of their lives. The biggest fight in the movie happens not between Nada and an enemy, but between Nada and Frank. It’s a crazy fight that we will get more into later on. For now, we have a movie about a drifter who gets a job at a construction site and finds a home at a sort of vagrant camp that is right next to a mysterious building where a religious group meets and sings songs. There’s a blind preacher who stands outside of the builidng and a signal clogging the airways on the TV stations where a man is preaching gospel about the end of the world and such things. Nada gets the idea that maybe the signal is coming from inside the building, or at least that there might be something in the building that is worth checking out. As it happens, he’s right. There is a religious cult that is using the building for meetings. The songs that everyone at the camp hears coming from the building are actually a recorded tape just playing over and over again on a loop while the meetings take place in secrecy. Nada sneaks around in the building and finds a box filled with glasses. He almost takes one, but then he has to run out before getting caught. Then the building gets blown up by a military air raid, and Nada wonders if the conspiracy the people meeting in the building were talking about might have had some truth to it. When he finds one of the boxes with the sunglasses in it, inside of a garbage truck, in a back alley, Nada jumps in and scrambles around looking for them. When he puts the glasses on, everything is in black and white and quiet, and the first thing he notices are signs. They say one thing when in color, (advertisements for products,) but they have hidden messages when in black and white. That’s when they say things like “conform,” “obey,” “marry and reproduce,” and “non independent thought.” Things get even worse when Nada starts looking at people and seeing that some of them have a sort of robotic skull for a head. Nada observes these people in their lives and figures out pretty quickly that they are the entitled elite who look down on everyone else. These are the spoiled snobs of society. He even tells a woman he meets in a grocery store, who is one of these creatures, exactly what he thinks of her. But Nada doesn’t know what it all means and he gets in a fight with some of these creatures and ends up killing them. He tries to find Frank and get him to help, only Frank has heard about the people Nada killed and considers his friend a murderer. Nada insists that if Frank will just try on the glasses, he will see exactly what Nada is talking about. Only Frank does’t want to put them on, and that’s what leads to their big fist fight in the alley that goes on and on. This is one of those movies like most alien films, f(rom Independence Day to Contact to Fire In The Sky to The Arrival, that reveals a little bit at a time until somewhere in the final act, we at last get the full picture. It’s usually a matter of that in the first act our characters are just making observations and by the end, they have actually boarded an alien ship and are getting the inside tour. This movie saved some pretty cool things for that final act, including new twists on characters and new advancements in technology. In fact, the final act is probably where the film succeeds most. That and the views of the aliens, as seen through the glasses. There are definitely some cool factors at work here, but the film just takes too long to really get going or dive into the plot. All the stuff about Nada first needing to find a job, then needing to find a place to sty then finding the church /. building, then snooping around to check it out, really does take a while. It’s important setup material, but some of it could have been cut in order to get to the good stuff a little faster. This is definitely a cool and entertaining film, but the pacing seems off. For science-fi, this one spends most of the first half just living in the real world. Luckily once the glasses come into play, things start getting a whole lot better.